Science Central’s Mixology 101- Cocktails and Food! 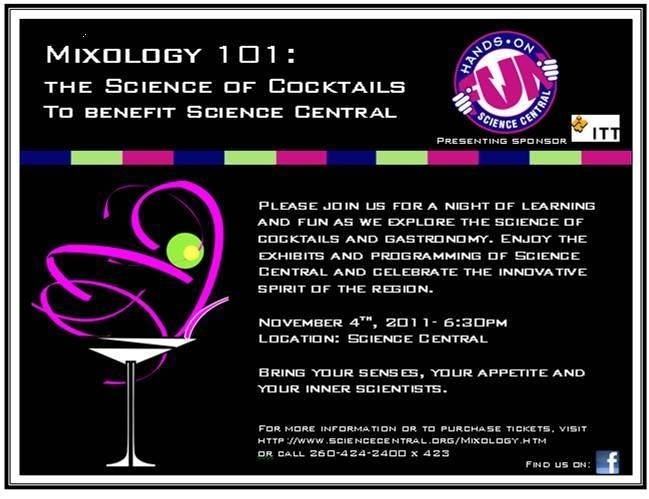 On Friday, November 4th from 6:30 – 10:30 pm, Science Central will host its 4th annual fundraising event, Mixology 101: The Science of Cocktails… the perfect fundraiser for someone obsessed with pampering the palette. Mixology 101 will feature 3 outstanding mixologists from around the country. Arthur Black- an extreme wine and food enthusiast that tries his hardest to engage the trade and public, demanding their appreciation for the finer things in life, yet always reinforcing the notion that such hedonistic articles are not reserved for the elite, foreign, or elderly, but should, and must be available to everyone and anyone remotely curious about the playground of the human palette. Las Vegas-based “Bobby G” Gleason- a professional bartender for more than 25 years and recognized worldwide as a champion mixologist. He has been widely published in trade and lifestyle publications where his expertise of spirits, cocktails, and proper barmanship provides valuable insight and inspiration to bartenders and cocktail enthusiasts all over the world. In addition, Bobby has had television appearances on CNBC, E! Entertainment Television, the Travel Channel, Fox & Friends in the Morning, local news stations both in the US and aboard. Sonia Sotello– the dedicated Tequila Ambassador for Tequila Don Julio distilleries for the Illinois and Indiana markets. Sonia is the expert representative of this award winning tequila portfolio with a deep history and heritage as one of best tequilas produced in Mexico. Her passion for Mexican culture, heritage and all things Tequila can be experienced through her engaging tastings and detailed presentations on Tequila Don Julio. Tiny bites of caprese salad on silver spoons garnished with olive oil powder. The students will mix extra virgin olive oil with salt and tapioca maltodextrin to form the powder. As guests come by the students will garnish each spoon with some of the powder. Mango Gnocchi topped with dry caramel. Mango puree is dropped from a pastry bag into a calcium bath, rinsed and topped with dry caramel (made using the same process as the olive oil). Each gnocchi will be plated on miniature square black plates. Lemon fizz garnished with ginger caviar.Using the same process as the gnocchi, ginger caviar will garnish a simple non-alcoholic lemon fizz drink displayed in mini martini glasses.